Hi there! I'm blogging this morning because I just realized that in another 12-24 hours, my arms will likely stop functioning for a few days so I better get things posted. Why would that happen? Welllll, yesterday I did some heavy lifting and I'm just waiting for my muscles to react to what I put them through. What did I do to them? 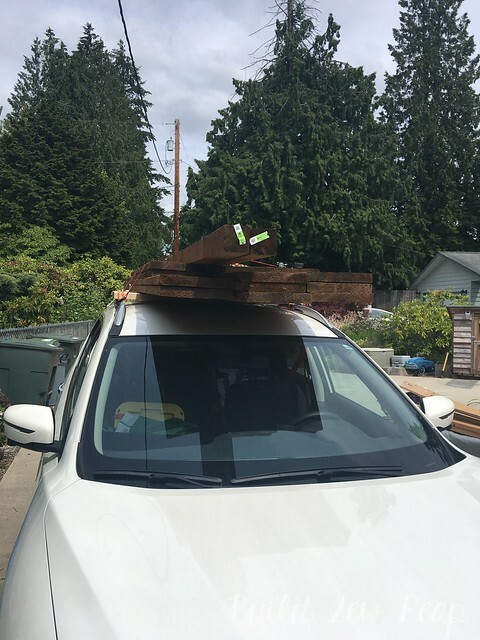 Well, for starters, I unloaded 800lbs of pressure treated lumber from the top of my car. I got it all unloaded and distributed to the areas where I'd need it then, after finishing up some of the work from Wednesday, I built a beam. This was a BIIIIIG beam too. I was working with 2x12s that were 10' long. 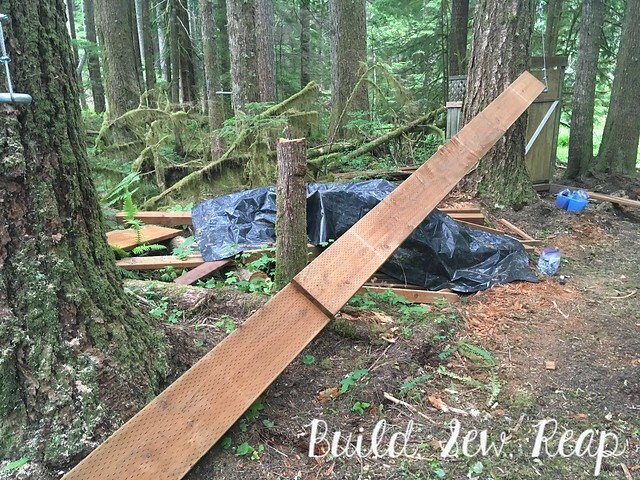 My ultimate goal was to build a 20' long beam that was 4x12. I knew I wouldn't be able to lift the fully assembled beam as that would include four 2x12s and the necessary hardware. A dry pressure treated 10 foot long 2x12 weighs around 70lbs and these weren't necessarily dry so I think they weighed more. At any rate, I got to work securing three together. Two were butted up end-to-end and the third spanned that joint. My plan was to add the remaining piece, cut in half, once it was up on the eye bolts. After many failed attempts and a whole lot of "OMG, what the heck?!?" moments, I did manage to get one end up. That beast was heavy. I'd estimate it was over 200lbs and I'm not a particularly strong woman. I don't work out at all anyway so it's not like my muscles are in top shape. I battled the other side until I finally lifted it to the other bolt but, because it was wobbly without the two final pieces to keep it stronger, I had to put it up flat instead of on end. So, it was time to rotate it up on end which proved to be even more difficult than lifting it up to the bolts in the first place. I was up at the property with 800lbs of pressure treated lumber. 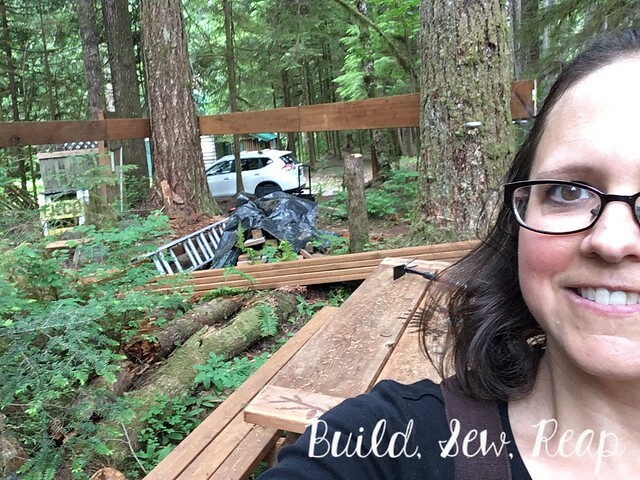 I had hauled all that lumber off the top of my car one piece at a time and positioned them close to where I'd need them. 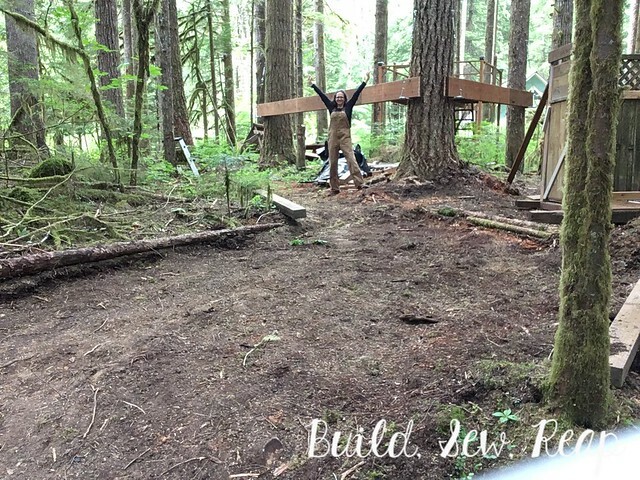 The next thing I did was secure three pieces together to create one 20-foot long beam that was approximately 200lbs. At this point, my muscles were already a bit fatigued but I was really determined to lift that beam up into position .... about 5 feet up. I started by lifting up one end and setting it on a sawhorse. Then I lifted the other end and set it on another sawhorse. 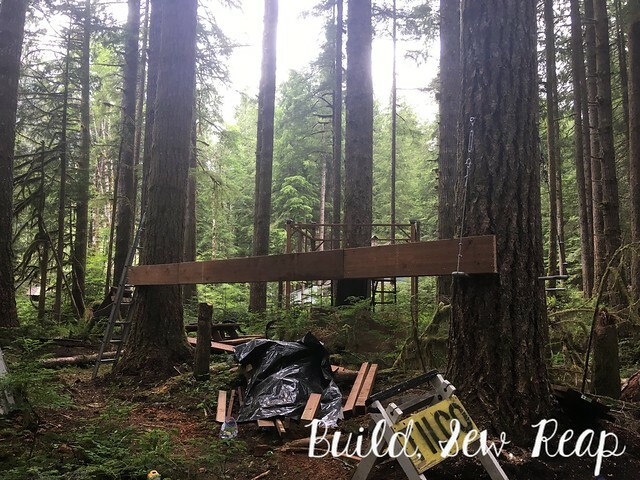 This left the beam about half as high as I needed it so the next step was to lift one end from the sawhorse and set it on one of my prepared bolts in a tree. I got it then moved to the other end and did the same. In retelling, I make it sound easy but this was H-A-R-D! My body was shaking from the strain long after I stopped lifting each time. I was out of breath and out of my mind quite frankly. The only problem I had at this point was that it was on it's broad side and I needed the entire 20' long beam to be up on edge. It was wobbly and unruly and waaaay too big for one person to manage but I was trying anyway. Just as I was really looking for another way to accomplish my goal, I heard a female voice, "Do you need some help?" I'd never met Diane before but there she was. She'd been gardening on the other side of town but needed to stretch a bit after being stooped over for too long. She decided to go for a walk and stumbled upon me in my moment of "holy hell, how am I going to fix this hot mess?!?!?" I was so thankful that no only was someone there right when I needed someone most but also, that it was a woman. I gladly accepted her help and the two of us easily flipped it up on edge. There was no real lifting involved, just rotating it in place which was made difficult for one person by the wobbliness of the beam at that point. We got it turned then she offered to hold it in place while I secured the cables to keep it from falling back over. Two minutes later, it was all secure. We chatted a little then she went on her way. I was not going to go knocking on someone's door for help. i'm a determined and stubborn worker and while I'll ask Scottie for help if he's out there with me, I really don't like asking relative strangers for a hand. Having someone, and not just anyone but a WOMAN, appear at exactly the moment I needed someone made me feel truly connected to the universe. I thanked Diane for listening to her women's intuition when it told her to go for a walk because clearly some part of me was calling for her, even if I didn't know it." 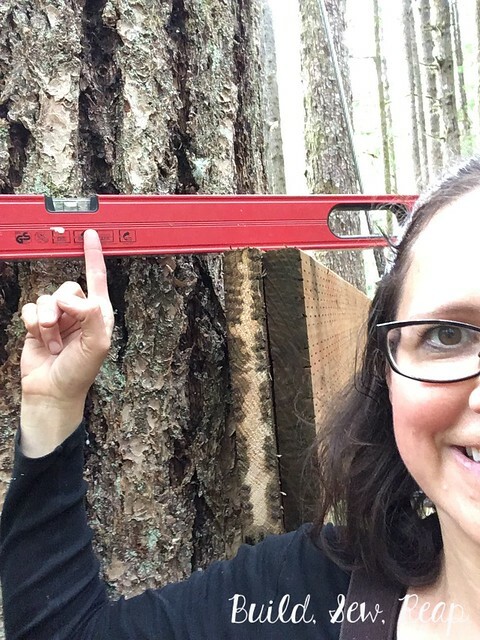 Feeling empowered and connected and all the great things one feels after hoisting a 200lb beam into place with the help of another woman, I moved on to prepare the final tree to receive beams. And here's a silly picture. 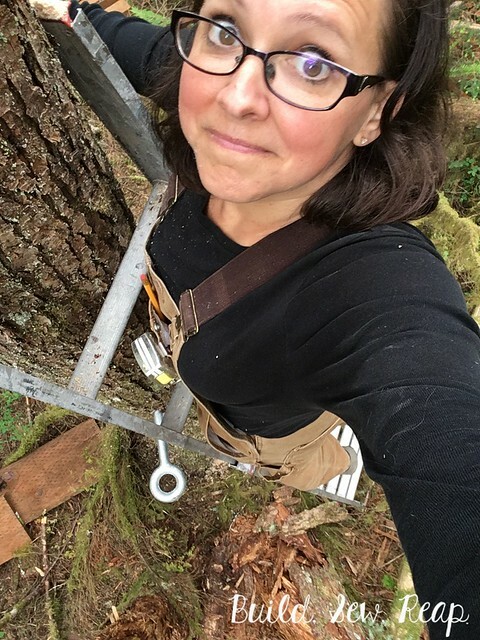 I took it because I'm generally pretty afraid of heights but have been up and down this ladder countless times since starting to build on our property. It's amazing how we can overcome our fears when we're on a mission. 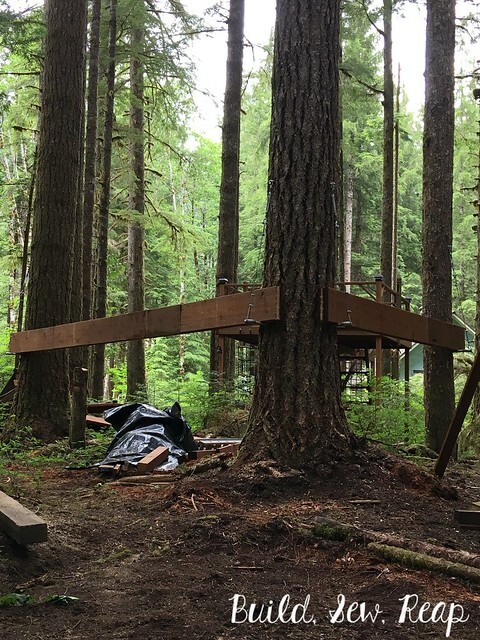 I got the final hardware set, built the 12' long beam, set it into place (more sweating and questioning my sanity) then stepped back to see what I'd done. After being shocked to see the project from afar, I checked for level and was thrilled to find all my measuring and checking and measuring some more had indeed been worth the effort. After putting the level back away, I took this picture. Those are some big beams!